Charles Dickens becomes the prime suspect in a murder when he is seen standing over a dead body on a Manchester stage while holding a gun. Fortunately for Dickens, he has a prior relationship with Superintendent Jones and the two of them set out to find the real killer. The search takes Dickens and Jones through some of the seedier neighborhoods and Dickens will face threats to his life. I definitely like the concept of Charles Dickens working with the local constabulary on solving crimes, and author J.C. Briggs seems to have a good historical knowledge of Dickens and his interests. Sometimes, however, this got in the way of the story as characters from Dickens’ books sometimes showed up (or, rather, characters who were the inspiration for Dickens sometimes made an appearance). This had more of a flavor of Briggs trying to show how clever she was, rather than something important to the story. The mystery itself was engaging enough, with a quite affable Charles Dickens leading the way (and of course it made perfect sense that he had the time to investigate). The character appearances was just distracting from the story (for me). This is the third book in a series, and there were a few moments when I felt as though I was missing a piece of information because I hadn’t read the previous books, but for the most part this stands alone as a story with a beginning, middle, and end. I have a pace when I read – a pace that lets me enjoy what I’m reading. I’ll slow down my pace for two reasons … 1) I’m really enjoying something and I absolutely want to savor it, and 2) I’m struggling to understand something. This dialog is #2 … I had to slow way down to really follow the dialog, and slowing down took me out of the story – the absolute opposite of what an author wants to do. Perhaps if I were British this would roll off the tongue a little easier for me? Although the mystery surrounding the murder was interesting, the book struggled to keep me reading as the pace often dragged. A great concept and a great character drawn from a recognizable historical figure, but the execution of the story didn’t quite work. Looking for a good book? 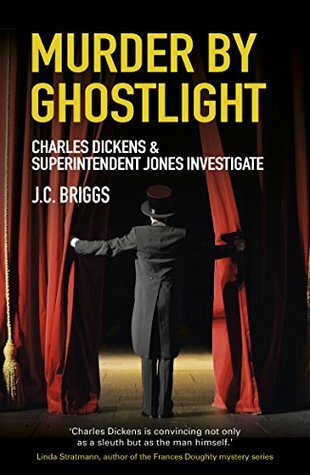 Murder by Ghostlight by J.C. Briggs is a wonderful concept, with Charles Dickens investigating a crime he’s accused of committing, but the story is a little too slow for a full recommendation.